Here’s a happy little weather-nugget: 30- year average April snowfall in the Twin Cities is 2.5 inches. Although I don’t see any April blizzards this year, we could still enjoy a few (minor) slush events in the weeks ahead. Then again, the beauty of an April snow: it usually melts within 24 hours. The sun angle is too high to keep snow on the ground for long. each day, with highs topping 60F. cool, dry, Canadian air force the biggest storms south of Minnesota. Good news for our ongoing flood risk. Models suggest half an inch of rain this weekend, but dry weather lingers from Monday into mid-April. We may just thread the weather needle. ECMWF 10-Day Rainfall Prediction. The European model prints out .4 to .7″ of rain for much of Minnesota by April 12 – most of that forecast to fall this upcoming weekend. Map: WeatherBell. Mississippi River Has Crested in St. Paul. River levels are forecast to recede, reaching 15′ next Tuesday, according to National Weather Service hydrologists. Graphic: Praedictix. 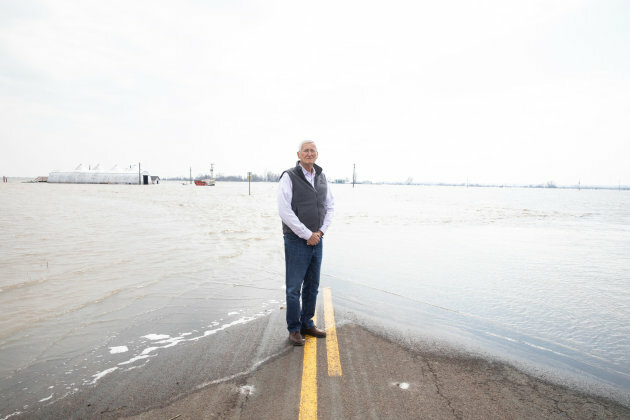 File photo credit: “Paddocks at Washington County Fairgrounds are shown underwater due to flooding in Arlington, Nebraska, U.S., March 21, 2019.” REUTERS/Humeyra Pamuk. April 3 is SafePlaceSelfie Day! A good idea to show off your safe space as we quickly sail into tornado season. Details via NOAA: “If there was one extreme weather preparedness action you want your loved ones to take, what would it be? For many, that one action is to know ahead of time where their safe place is located. On April 3rd, 2019, at 11:11am local time, please join the National Weather Service and its Weather-Ready Nation Ambassadors to take a “selfie” and post with the hashtag #SafePlaceSelfie. Photo credit: “Forecasters at the National Weather Service office monitor Hurricane Irma Saturday, Sept. 9, 2017, at the hurricane center in Miami.” (AP Photo/Andy Newman) ASSOCIATED PRESS. Animation credit: “We spend most of our lives inside, where air quality has received little scrutiny.” Daniel Savage. Photo credit: Google Street View. “Pub chain Samuel Smith has banned its punters from using mobile phones and iPads across its 300 establishments.” Pictured: The Fitzroy Tavern Pub. 50 F. Twin Cities high on Tuesday. 51 F. average high on April 2. 34 F. high on April 2, 2018. April 3, 1999: An ice storm hits Duluth and the Arrowhead. An 800 foot television tower in Duluth collapses due to the weight of the ice. April 3, 1982: A sharp cold front causes the temperature at Lamberton in Redwood County to drop from 78 to 7 degrees. This 71 degree change in 24 hours is the maximum 24-hour temperature change in Minnesota. April 3, 1837: A snowstorm rages for four days at Ft. Snelling and dumps 9 inches. Photo credit: “A man carries food aid he received from a local charity during the holy month of Ramadan in Sanaa, Yemen May 31, 2017.” REUTERS/Khaled Abdullah. Investors Ramp up Pressure on Exxon over Climate Change. Axios has an update: “Investors on both sides of the Atlantic are pushing ExxonMobil to disclosetargets that would drastically reduce its greenhouse gas emissions in line with the Paris climate agreement. Driving the news: The New York public pension fund and Church of England’s endowment have filed a resolution for consideration at Exxon’s annual meeting in May calling for the company to disclose such targets. The oil giant has asked the federal Securities and Exchange Commission, which governs the process, to throw it out. A decision is expected imminently. 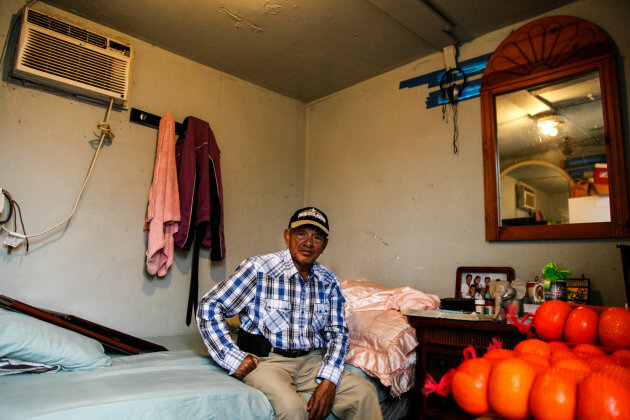 Photo credit: “Jorge lives in a small efficiency near downtown Miami. He sells fruit on the street to make a living, and says he has felt the impacts of increasingly hot summers on his health.” Maria Alejandra Cardona for NPR. Judge Shuts Down Admin’s Drilling Plans: Climate Nexus reports: “A federal judge has overturned the Trump administration’s order to open the Arctic and Atlantic oceans to offshore drilling, reinstating Obama-era drilling bans that the administration had sought to reverse. US District Court Judge Sharon Gleason said in a ruling late Friday in a suit brought by a coalition of environmental groups against the administration, the state of Alaska and the American Petroleum Institute that Trump’s 2017 executive order overturning the bans “exceeded the president’s authority,” ruling that expanding the drilling area would require an act of Congress. “This is a great victory for the Arctic, its polar bears, other wildlife and communities,” the Center for Biological Diversity attorney Kristen Monsell said in a statement. “It’s absolutely the right outcome under the law and for the sake of our planet.” (AP, Reuters, Washington Post $, WSJ $, The Hill).